The weight loss and metabolic benefits of the Roux-en-Y gastric bypass (RYGB) have made it one of the most popular treatments for managing morbid obesity, with the peak number of procedures in the United States reaching 65,000 annually in 2012. Over the last 5 years, sleeve gastrectomy has surpassed RYGB as the most popular surgical option for managing morbid obesity, due to comparable metabolic outcomes and a lower complication rate., Despite this, the number of patients undergoing RYGB remains substantial, with 40,000 operations performed in the United States in 2016. When considering the historical cohort of patients who have undergone the RYGB and the ongoing number of these procedures being performed, endoscopically accessing the pancreaticobiliary region in these patients will remain a significant clinical challenge. 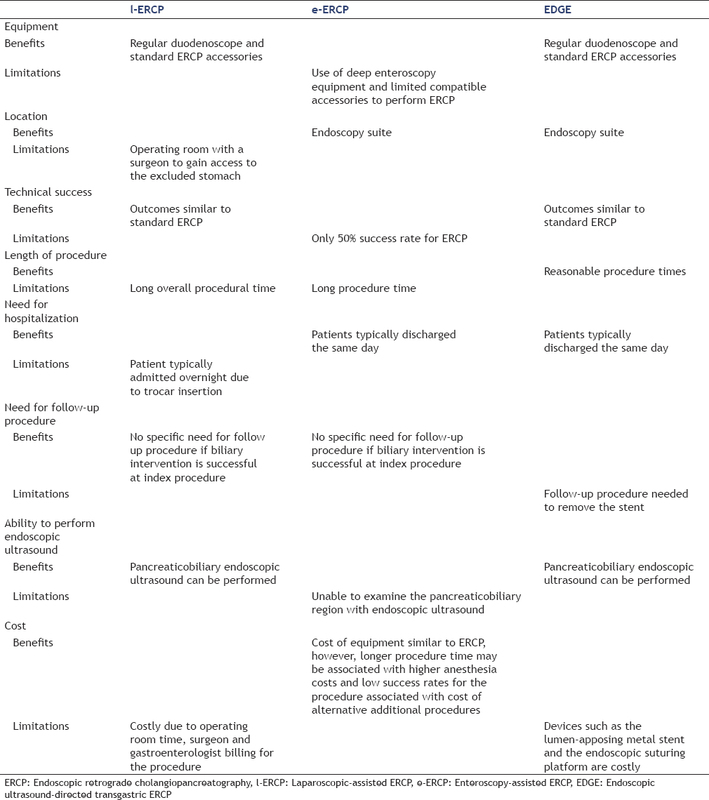 For many years, the standard techniques to endoscopically access the pancreaticobiliary region for diagnostic or therapeutic reasons have been enteroscopy-assisted ERCP (e-ERCP) and laparoscopy-assisted ERCP (l-ERCP)., The main limitations of e-ERCP include required proficiency at enteroscopy, long procedure time required to reach the ampulla, technical success of only 50%, and limited ERCP accessories that are appropriate for use with an enteroscope. In addition, repeat e-ERCP is time-consuming as accessing the ampulla through deep enteroscopy remains challenging. While the technical success of l-ERCP is similar to standard ERCP, it too has a number of drawbacks that include coordination with a surgeon in order to provide access to the excluded stomach through a trocar incision in the abdominal wall; an overnight stay is often required due to the abdominal incision, and repeat procedures require a similar approach with access to the stomach through the abdominal wall., Due to some of these limitations and the development of new endoscopic tools, EUS-directed transgastric ERCP (EDGE) has emerged as a viable alternative to these other techniques. In comparison to l-ERCP and e-ERCP, EDGE allows the procedure to be performed in the endoscopy unit using a duodenoscope and standard ERCP equipment with repeat procedures performed in a similar manner to standard ERCP. However, it should be noted that the limitation of this procedure is that the lumen-apposing metal stent (LAMS) will have to be removed endoscopically after the transgastric fistula has matured. There is also a theoretical risk of permanently reversing the RYGB due to a permanent gastrogastric fistula; however, this has not been reported. A detailed list of the benefits and limitations of all three methods to access the pancreaticobiliary region in RYGB patients is presented in [Table 1]. For the purpose of this technical review, we have broken down the technical aspects of EDGE into the following components: (1) creation of the transgastric fistula, (2) methods to reduce migration of the LAMS, (3) performing diagnostic or therapeutic interventions through the transgastric fistula, and (4) removal of the transgastric stent and closure of the fistula. As there are limited published data available on this procedure, many of the aspects discussed herein are based on the authors' own experience of performing this procedure. A flow diagram for the timing of the steps required in the EDGE procedure is presented in [Figure 1]. The technical success of creating the transgastric fistula (gastrogastrostomy or jejunogastrostomy) to access the excluded stomach is 100% in the limited number of published series describing this procedure.,, The excluded stomach can easily be identified from the gastric remnant or the proximal jejunum, just distal to the gastrojejunal anastomosis (and occasionally from the short blind pouch). On EUS, the rugae and thick muscularis propria layer of the collapsed (partially or completely) excluded stomach can be easily differentiated from the thin-walled tubular small bowel [Figure 2]. The optimal location for creation of the transgastric fistula is such that the distal flange of the LAMS terminates in the body of the excluded stomach. While creation of the fistula with the antrum is technically possible, its disadvantages are twofold. First, the antrum is small in diameter and the muscularis propria is thickest at this point in the stomach, making placement of the LAMS more challenging. Second, passing the duodenoscope through the LAMS into the antrum and then into the pylorus can be difficult, due to the angulation as the duodenoscope protrudes out of the LAMS. With placement of any LAMS, the mucosal to mucosal surfaces should be no more than 10 mm apart. After identification of the excluded stomach, it is punctured with a 19-g fine-needle aspiration needle and contrast mixed with saline is injected to confirm positioning within the stomach on fluoroscopy [Figure 3]. A large volume of fluid and contrast (typically 250–500 cc) is injected into the excluded stomach to cause gastric distension to aid LAMS placement [Figure 4]. The dilated stomach readily allows for freehand placement of the cautery-assisted LAMS. In the early series before the widespread utilization of the cautery-assisted LAMS, wire-guided LAMS placement with the first-generation LAMS has been extensively described.,, The authors do not believe that the wire-guided technique offers any advantages over the freehand technique as long as the excluded stomach is well distended with fluid. We often administer antimotility agents (e.g., glucagon) to ensure retention of fluid within the stomach. Once the LAMS has been placed, it is dilated with a dilation balloon over a wire if immediate endoscopic access to the pancreaticobiliary region is required. After placement of the LAMS, the gastric pouch is now once again exposed to acid from the previously excluded stomach, predisposing patients to the development of gastroesophageal reflux symptoms, esophagitis, and ulceration at the transgastric fistula. Patients should be followed closely for the development of these complications and where appropriate, acid suppressive therapy should be commenced. Stent migration during ERCP has been a common complication in the limited series describing this procedure, occurring in 19%–60% of cases.,, Most commonly, the LAMS migrates into the excluded stomach over the duodenoscope as it is being advanced to the pancreaticobiliary region. This can result in perforation at the site of the fistula tract if this transgastric fistula has not been allowed to mature. In general, these perforations are self-limited if treated intraprocedurally. 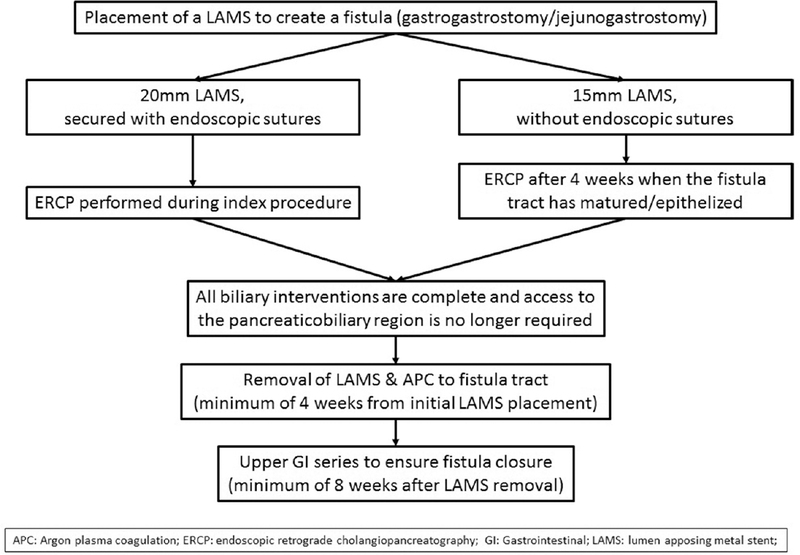 Management of LAMS migration is typically done by withdrawing the LAMS back into position across the fistula or placing a new LAMS across the fistula. In addition, placement of a covered through-the-scope esophageal stent across the fistula and LAMS to prevent dehiscence has been described. The 15-mm LAMS has most commonly been used to fashion the transgastric fistula in the published literature. Standard duodenoscopes are approximately 12 mm in diameter leaving limited room between the duodenoscope and the 15-mm LAMS. This limited space generates significant friction during ERCP, predisposing the LAMS to migration. In the authors' opinion, the placement of the 20-mm LAMS which was recently approved for use in the United States offers a substantial advantage to the 15-mm LAMS by reducing this friction. 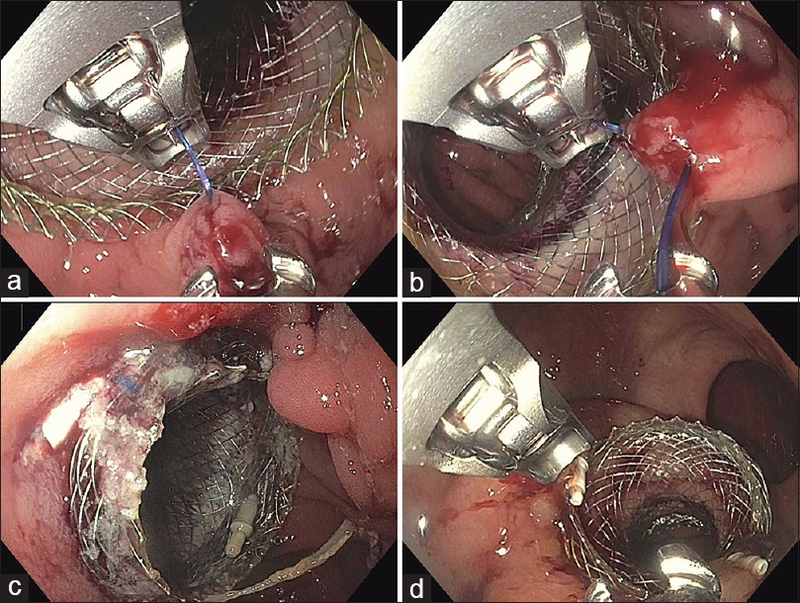 To further prevent the risk of migration, the proximal side of the LAMS can be sutured to the luminal wall with an endoscopic suturing device [Figure 5], a mechanism previously described to reduce migration of fully covered stents in the management of benign upper gastrointestinal conditions., In the authors' experience, placing a 20-mm LAMS and securing it with endoscopic sutures allow the initial ERCP to be performed with very low risk of LAMS migration during the index procedure. This approach is the one that has been adopted at our institution, as it allows for immediate access to the pancreaticobiliary region with minimal risk of LAMS migration and resulting perforation. 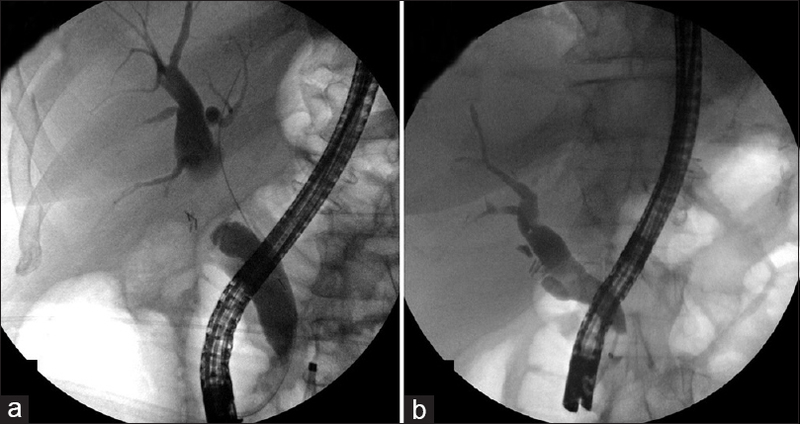 A clinical success of 91%–100% has been reported in performing ERCP either at the same time as the LAMS placement or during a subsequent procedure after allowing the transgastric fistula to mature [Figure 6].,, In comparison to a standard ERCP procedure, the additional maneuver required is advancement of the duodenoscope through the LAMS. 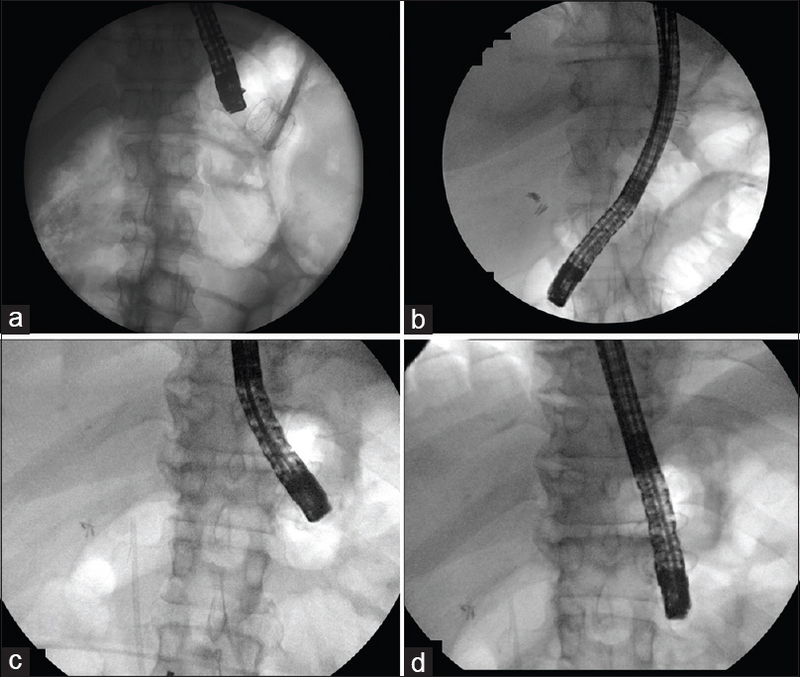 This is commonly done with both endoscopic and fluoroscopic guidance [Figure 7]. In the authors' experience, the use of a 20 mm as compared to the 15-mm LAMS allows easier passage of the duodenoscope. After ongoing access to the pancreaticobiliary region is no longer required, the LAMS can be removed. Based on results of the time required for fistula maturation after EUS-guided gastrojejunostomy in a large animal model, we recommend 4 weeks from initial LAMS placement to LAMS removal. 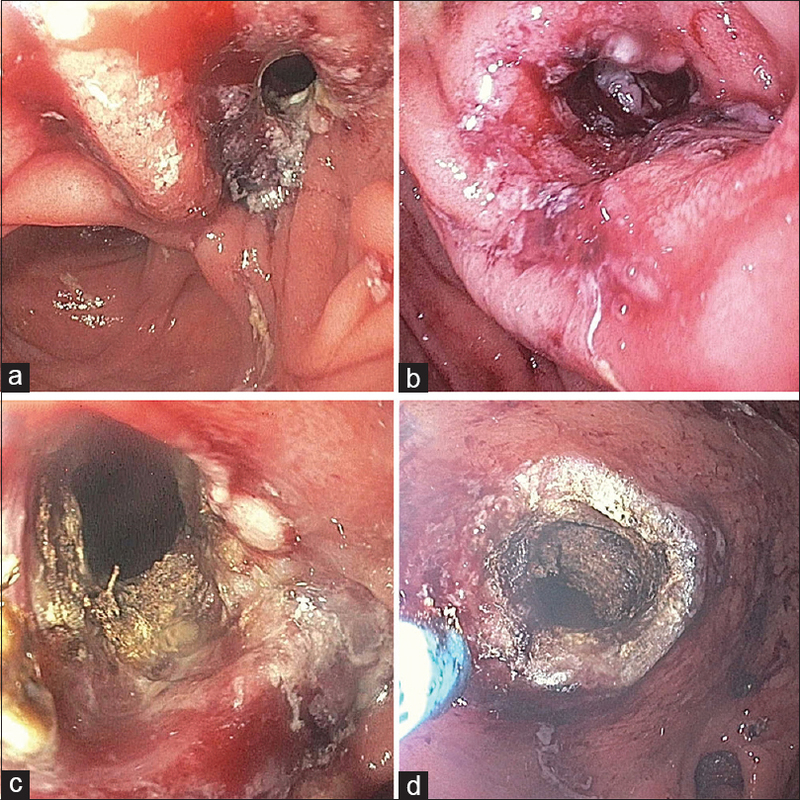 In published series describing EDGE, the majority of patients underwent primary closure after LAMS removal with endoscopic suturing or over-the-scope clips.,, A number of patients in these studies were also treated with de-epithelization by argon plasma coagulation (APC) alone and the fistulas subsequently closed by secondary intent [Figure 8]. The practice of the authors is such that after removal of the LAMS, APC (40 watts, 2 L flow) is aggressively applied to the fistula tract for de-epithelization with no other primary closure method use. As the gastric pouch and stoma are now exposed to gastric acid, we also recommend leaving the patient on acid suppression therapy until fistula closure is confirmed. It is our practice to perform an upper GI series 8 weeks after removal of the LAMS to ensure fistula closure. In the authors' experience, the risk of a persistent fistula is limited provided sufficient time has been given from LAMS removal to examination of the fistula tract. It has been reported that a minority of transgastric fistulas do not close on follow-up and require secondary closure., However, the timing of when the tracts were assessed and when the fistula was endoscopically closed was not specified in these studies. It is possible that not enough time was given to allow for spontaneous fistula closure in these early studies. A potential mechanism for spontaneous fistula closure by secondary intent is that unlike fistulas seen after bariatric surgery which are often avascular in nature, these transgastric fistulas are created in relatively healthy tissue. Nonetheless, it is worth mentioning that the LAMS should be removed as soon as endoscopic access to the pancreaticobiliary region is no longer required. Leaving the LAMS in situ for a prolonged period of time may predisposes to the formation of a chronic fistula, which will be more challenging to close by primary or secondary intent. While the technical success of pancreaticobiliary access is high, there are a number of important gaps in our knowledge. The risk of stent migration when performing ERCP at the index procedure if the larger LAMS is utilized and secured is unknown. In addition, the rate of persistent fistula after LAMS removal and the optimal time for any intervention required to close a persistent fistula is unclear. In the era of cost-conscious health care, the cost of the accessories for the EDGE must be taken into consideration. However, this cost must be considered in the context of the failure rate and time required to perform e-ERCP and the operating time and utilization of a surgeon to perform l-ERCP. The EDGE procedure is currently in its infancy, but due to the number of benefits it offers over alternative options for performing pancreaticobiliary intervention in RYGB patients; it is only likely to grow in its utilization as the cohort of patients with RYGB advances is age and grows in number. Estimate of Bariatric Surgery Numbers; 2011-2016. Available from: https://www.asmbs.org/resources/estimate-of-bariatric-surgery-numbers. [Last accessed on 2018 Apr 01]. Salminen P, Helmiö M, Ovaska J, et al. Effect of laparoscopic sleeve gastrectomy vs. laparoscopic roux-en-Y gastric bypass on weight loss at 5 years among patients with morbid obesity: The SLEEVEPASS randomized clinical trial. JAMA 2018;319:241-54. Osland E, Yunus RM, Khan S, et al. Postoperative early major and minor complications in laparoscopic vertical sleeve gastrectomy (LVSG) versus laparoscopic roux-en-Y gastric bypass (LRYGB) procedures: A meta-analysis and systematic review. Obes Surg 2016;26:2273-84. Schreiner MA, Chang L, Gluck M, et al. Laparoscopy-assisted versus balloon enteroscopy-assisted ERCP in bariatric post-Roux-en-Y gastric bypass patients. Gastrointest Endosc 2012;75:748-56. Souto-Rodríguez R, Alvarez-Sánchez MV. Endoluminal solutions to bariatric surgery complications: A review with a focus on technical aspects and results. World J Gastrointest Endosc 2017;9:105-26. Kedia P, Tyberg A, Kumta NA, et al. EUS-directed transgastric ERCP for roux-en-Y gastric bypass anatomy: A minimally invasive approach. Gastrointest Endosc 2015;82:560-5. Ngamruengphong S, Nieto J, Kunda R, et al. Endoscopic ultrasound-guided creation of a transgastric fistula for the management of hepatobiliary disease in patients with Roux-en-Y gastric bypass. Endoscopy 2017;49:549-52. Tyberg A, Nieto J, Salgado S, et al. Endoscopic ultrasound (EUS)-directed transgastric endoscopic retrograde cholangiopancreatography or EUS: Mid-term analysis of an emerging procedure. Clin Endosc 2017;50:185-90. Azeem N, Skaudis SM, Amateau SK. Transluminal drainage with a cautery-assisted 20-mm lumen-apposing metal stent. VideoGIE 2018;3:153-4. Bick BL, Imperiale TF, Johnson CS, et al. Endoscopic suturing of esophageal fully covered self-expanding metal stents reduces rates of stent migration. Gastrointest Endosc 2017;86:1015-21. Ngamruengphong S, Sharaiha RZ, Sethi A, et al. Endoscopic suturing for the prevention of stent migration in benign upper gastrointestinal conditions: A comparative multicenter study. Endoscopy 2016;48:808. Park SW. Commentary on “Endoscopic ultrasound (EUS)-directed transgastric endoscopic retrograde cholangiopancreatography or EUS”. Clin Endosc 2017;50:102-3.